Harriet Harman woke up to the sound of overweight superheroes clambering on her roof this morning – for the second time in as many months. Two more Fathers4Justice campaigners have scaled her roof, unfurling a banner saying ‘Stop the War on Dads’ in the process, and vowing to stick it out for the long haul. 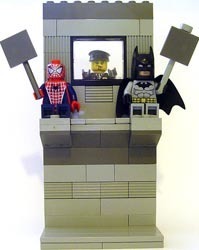 The two intruders – dressed as Spiderman and Batman – targeted the Minister for Women and Equality because of her stance on equality in the workplace. They claimed (from the rooftop) that the government was ignoring equality for dads, and that it was practicing a ‘feminist agenda’. One of the protesters, Mr Ace from Bristol, added that he was ‘trained in survival’ and added that they would be up there for as long as it takes. Ms Harman can only hope that a day’s relentless rain will weaken wither their resolve (or grip) so that she doesn’t have to move out of her house again. Photo courtesy of Minifig's Photostream under the Creative Commons license.